I awoke to a rainbow this morning. 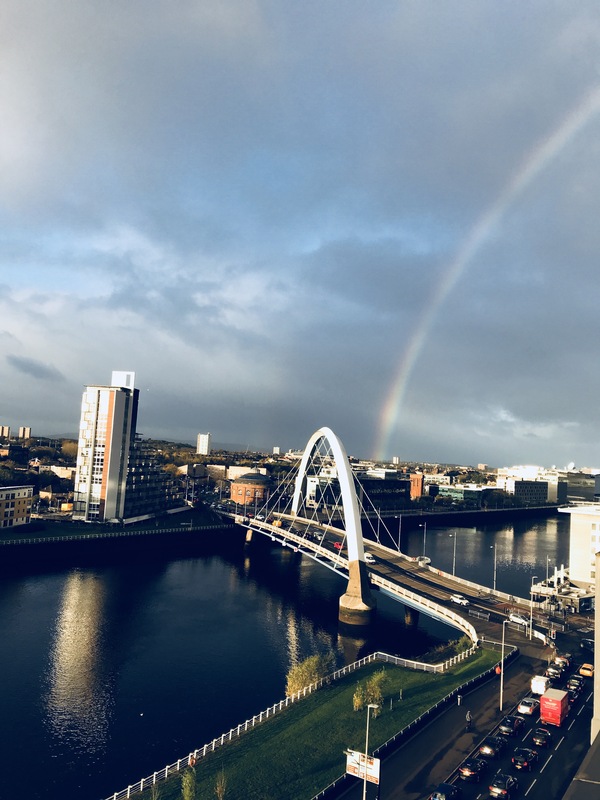 After making a cup of coffee I stepped out onto the balcony and looked over at “the squinty” bridge in Glasgow, Scotland. And there it was, a rainbow! A “promise remembered”! A great start to a new day, one that was mixed with exhilaration and small disappointments. Throughout the day I remembered the rainbow as well as what it meant; God’s promise First given Noah and to all of his descendants until the end of time. What was a weapon of war became a symbol of reconciliation and hope and peace and Love. God is not angry with us; disappointed at times, but not angry. God does never writes us off, even if others do. Rather, God calls us to a new way of life, a way of life that sets aside selfish ambition and seeks to “enjoy and glorify God forever”, for that is why we were created.